The fossil of a 43-million-year-old whale with four legs, webbed feet and hooves have been discovered in Peru. 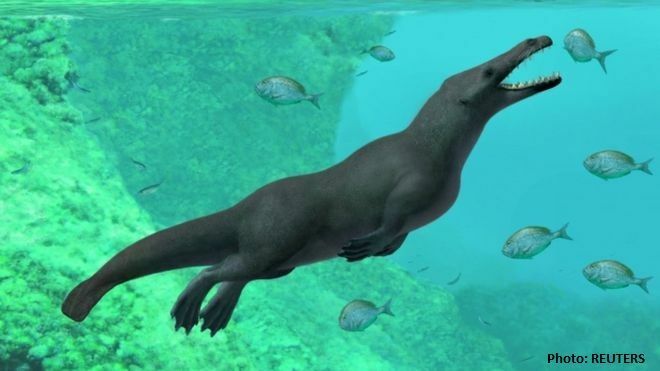 Paleontologists believe the marine mammal's four-meter-long (13 ft) body was adapted to swim and walk on land. "This is the most complete specimen ever found for a four-legged whale outside of India and Pakistan," Dr. Olivier Lambert, a scientist at the Royal Belgian Institute of Natural Sciences and co-author of the study, said. It was found in marine sediments 1km (0.6 miles) inland from Peru's Pacific coast, at Playa Media Luna. The location has piqued researchers' interest as the first whales are thought to have first evolved in South Asia around 50 million years ago. As their bodies became better suited to water, they migrated further afield to North Africa and North America, where fossils have been found. The latest discovery suggests early whales managed to swim there from South America.